When Ink Crew approached me to join their project, to guide them in their first mosaic, I eagerly agreed. 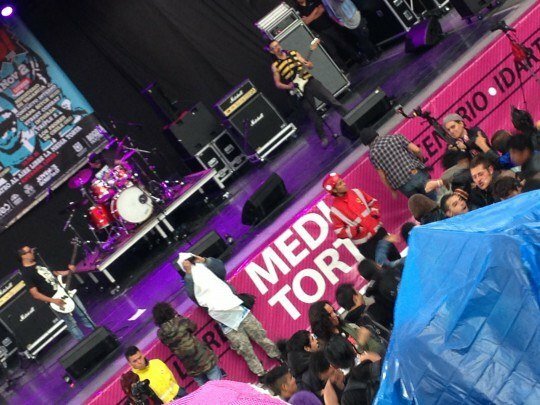 Ink Crew are a graffiti and street mural team based in Bogota, Colombia whom I had seen in action at the Street Art Biennale in Cali the previous year, and they were great. I firmly believe that the true art of our times is to be seen on the streets of the world. It is here that the dispossessed and marginalised express themselves and also the place of choice for artists who have no interest in the narrow and elitist western gallery system. 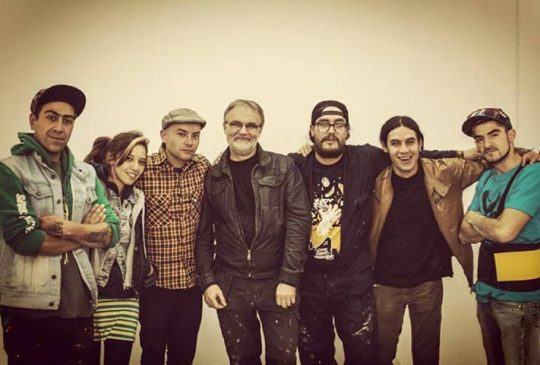 Ink Crew are are far more than a group of guys doing great graffiti, they are committed to a fully engaged practice and to do that they use all the talents around them: graffiti; music; architectural design; comics and publications; community workshops and local and reminiscence history. For this project they were already undertaking workshops with the community in preparation, including consultation and workshops with the many displaced indigenous peoples of Colombia who find themselves living on the impoverished outskirts of Bogota. 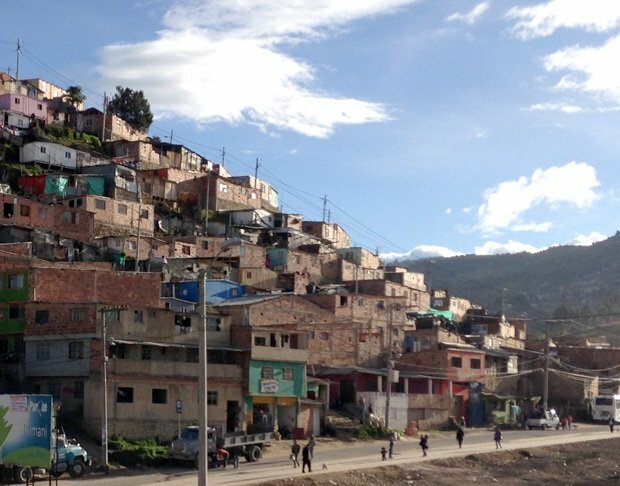 The project began with a site visit, we went by a series of buses, out of the city and up into the barrios surrounding Bogota. 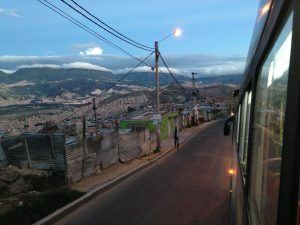 The last bus climbed up and up to the barrio of Paraiso, on top of a mountain overlooking Bogota. My first view of the mosaic site was one of stunned disbelief. I hadn’t appreciated just how vast this mosaic actually was, at 2 metres high and some 48 metres long, the wall they wanted to mosaic in just a month seemed impossible. But such was the determination of Ink Crew’s powerhouse organiser David Baron Lopez that he was determined to make it happen. The first job was to hunt out some more tiles to supplement the mainly white donated tile. We hunted from shop to shop selecting colours here and there. 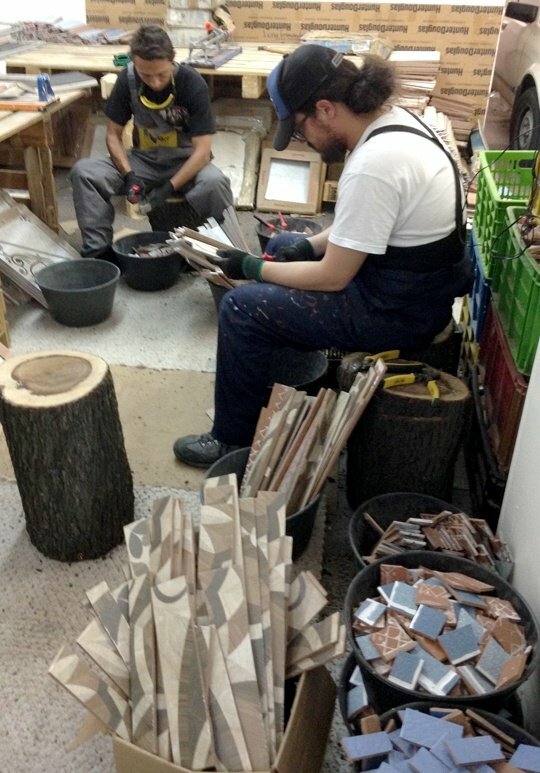 Most of the tiles were large format glazed porcelain similar to those I had found in Cali and Santiago de Chile. I thought that the best way to proceed was to cut down the tiles to a more manageable size approximately 10x4cm, a huge task in itself. 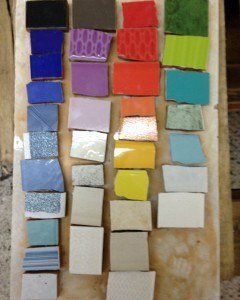 We sat for days in a workspace in Bogota cutting down the mountain of tiles, whilst I also worked out the colour palette and quite how we could achieve the work. 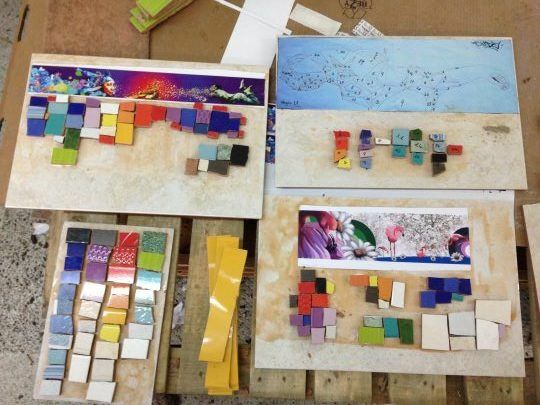 We had initially planned on making the mosaic off site but I became worried that the extra time and co-ordination involved for such a large mosaic might find me having to leave before the crucial installation began. At least, I thought, if we made the mosaic direct on site then the participants would have gained enough knowledge to finish the work without me if we ran out of time. The theme chosen for the mosaic was ‘Las Manos de Todos’, – ‘The Hands of Many’ this theme reflected ideas of the community uniting together to build and improve their environment, and nicely summarised the communal effort necessary to realise a work of this scale. Ink Crew had invited me to contribute a design alongside the other artists, known by their tag names, Skida, Dex, Ospen and Kops. 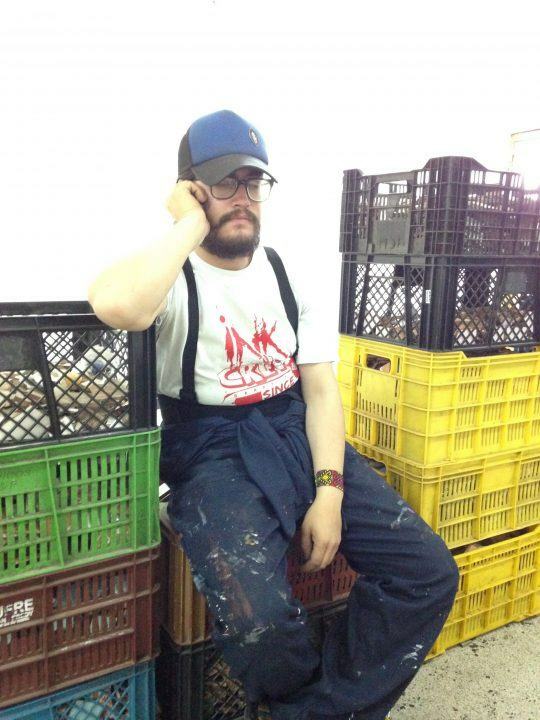 However I was reluctant. My usual way of designing is to take time, to research and talk to the local community and to draw out the hidden stories of a particular place. I knew that Ink Crew had been carrying out community workshops, particularly with the displaced Indigenous communities now living in the barrio where the site was. I felt that they were better placed to draw out the right images for this very special place. I decided that my best role was to guide the making and pull the different designs into a cohesive and achievable overall design which reflected my overview of the project.. In hindsight I realise that this was really going against the culture of graffiti artists, who, I came to realise, are used to being given complete control of their own vision, and prefer to have a series of individual panels. So my attempt at a unifying overall design met with limited success. This report first appeared for the MAANZ (Mosaic Association of Australia and New Zealand) May 2016 edition of their emag vol 14.